A wide array of documentation both official and non-official exists for SQLAlchemy. The following is a guide to the some of the best information available. The SQLAlchemy Reference Documentation is by far the most important place for both the newest user and the veteran alchemist. The Reference Documentation represents an ongoing effort that rivals that of the SQLAlchemy project itself, and is constantly evolving to be ever more complete and navigable. The newest versions of the documentation will be the most up-to-date and accurate; features and behaviors that were only introduced in more recent versions should always be noted. Patterns Implemented by SQLAlchemy - more architectural insights discussing the influence of Martin Fowler's work on SQLAlchemy's development. Django-style Database Routers in SQLAlchemy - background on how to build an ORM Session that refers to different databases using a custom routing scheme. The Enum Recipe - when and how to use enumerated types with SQLAlchemy. Automation Should Be Like Iron Man, Not Ultron - describes an approach to automation that favors and assists the expertise of the user, instead of attempting to automate most use cases behind a facade (leaving the remaining 20% of them as inscrutable headaches). This describes perfectly the rationale for SQLAlchemy's API design. In this talk we'll illustrate a simple web application using SQLAlchemy, showing off the style of development that SQLAlchemy is most geared towards, the so-called "foundational" style which provides for development and maintainance of custom conventions which then service the needs of the model declarations and use case implementations. 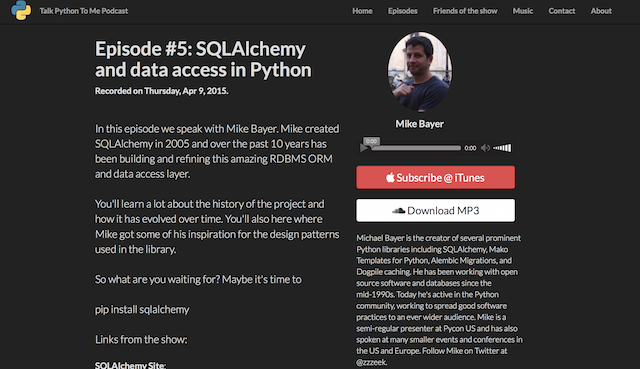 An interview with Mike Bayer in the Talk Python to me Podcast series. Discusses the history of the project and how it has evolved over time. This talk provides a broad-based introduction to SQLAlchemy Core library. It is focused on someone new to SQLAlchemy Core, who has experience with other database technologies such as Django or SQLAlchemy ORM. We'll cover the differences between the domain-centric models of those tools compared to the schema-centric model and how we can use that to deal with common and unusual data sources. Working with developers on schema migrations is a perennial challenge for DBAs and developers. Devs tend to like a "set it and forget it" tool. This talk discusses the strategies used to move from a pure SQL and shell migration system to using SQLAlchemy and Alembic for maximum DBA and developer happiness. Too often, programmers use ORMs to hide from their database and avoid learning how it works. Instead, I encourage programmers to learn a bit of SQL and become familiar with the problems that database queries are designed to solve well. In this talk, I outline the basics of using SQLAlchemy to craft efficient queries and avoid several common database query anti-patterns. This talk describes why SQLAlchemy has always been called a "toolkit", detailing the software construction mindset for which SQLAlchemy was designed to be used with. The talk refers to this as the "Hand Coded" approach, and has an emphasis on user-created patterns and conventions, along with explicit exposure of relational structures. This talk describes how SQLAlchemy abides by what has been described as the complimentarity principle of automation (not to be confused with the more common physics term), allowing the library's work to be exposed as a series of transparent automation tools, rather than as an opaque wall hiding the details. This is Mike Bayer's own "getting started" tutorial that presents a fast paced but beginner-focused tutorial on what SQLAlchemy is all about. While the tutorial has evolved over the years and at this point is fairly fixed. The "Prerequisite Material" is highly recommended and includes a PDF introductory guide as well as a self-installing, runnable code demo that's used in the tutorial. A series of beginner-focused SQLAlchemy tutorials covering a wide range of basic topics. While a lot of the information here is derived from the main documentation, the pace is slower and there are also details culled from other sources, including performance tips, comparison to other ORMs, and design philosophies. A very good effort by author Xiaonuo Gantan. This is a "nutshell" style tutorial that quickly introduces the major areas of SQLAlchemy using simple examples, covering raw SQL, schema concepts, SQL Expression language, and the ORM including querying and relationships. This is the official tutorial for SQLAlchemy integration within the Pyramid Web Framework. The basic steps to integrate SQLAlchemy within a traditional web application are laid out here and are mostly in conformance with those guidelines referenced by SQLAlchemy's documentation.